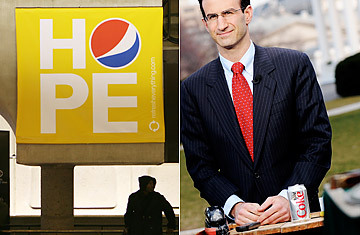 That said, the marketing campaign, which includes TV and print ads as well, does raise a question: Is Pepsi actually the choice of the Obama Administration? Though Pepsi is available in the West Wing mess, it is rarely, if ever, seen out in the open. On Thursday, the recycling bin outside White House spokesman Robert Gibbs' office contained six cans of Diet Coke and one can of Sprite Zero, which is also a Coca-Cola product. In another part of the building, I asked a White House official, who had a can of Diet Coke sitting on his desk, if the Obama Administration had a clear bias for Coke over Pepsi. "I think that's true," the official responded, with a smile. "Don't most Americans?" To a certain degree, yes. Nationwide, Coke is more popular than Pepsi, but not by the same margin seen among White House staff. Beverage Digest, a trade publication, reported that Coke and Diet Coke had a 27.2% share of the carbonated-beverage market in 2007, compared with a 16.7% share for Pepsi and Diet Pepsi. As an official matter, the U.S. government is usually nonpartisan in the cola wars. In congressional office buildings, both Coke and Pepsi products are sold at vending machines, as they are in the waiting room at Andrews Air Force Base, where reporters wait to board Air Force One. In the air, the President's personal flight crew offers either cola to passengers. Nor is soda the only option for officials working in the White House. Several members of the press operation keep going with a steady diet of coffee, while one younger member of the White House Web team was spotted recently walking to work with a case of kombucha, a fermented tea drink sold at health food stores. The health-conscious President is not known to have a strong preference for either Coke or Pepsi  though he was spotted at one debate sipping from a bottle of Aquafina water, which is made by PepsiCo. Obama is, however, a well-known fan of Honest Tea, a drink made by a company that is 40% owned by Coca-Cola. Read the top 10 food trends of 2008.